The 5.56x45mm was developed during the Vietnam War and has become one of the most popular rounds around the world in military, civilian, and law enforcement use. Whether you want to feed your family, eradicate varmints, compete in a shooting match, or just plink around at the range, the 5.56x45mm is just the incredibly versatile and proven round you are looking for. Lithuanian Surplus ammo is a fantastic way to save on ammo. With this inexpensive, clean burning ammo, you have everything you need to blast away at the range without hurting your wallet. Firing at high speeds with accuracy and non-corrosive powder, these 62 grain, full metal jacket SS109 (NATO's equivalent of M855 green tip), brass cased, boxer primed rounds are perfect for all your range training needs. 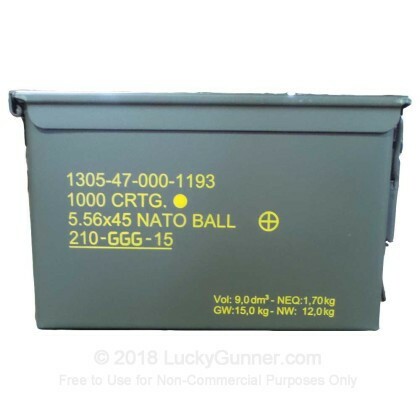 These 1,000 rounds are packed loving in a 50 cal metal ammo can that will last you years after you run this great ammo though your black gun. 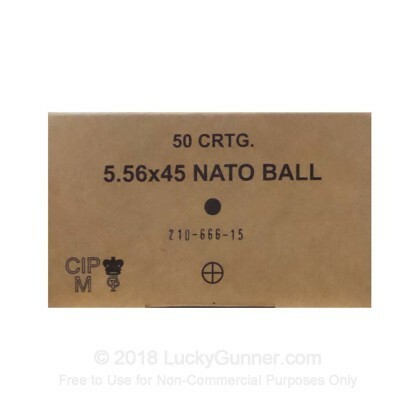 We don't have any reviews yet for this particular 5.56x45mm ammo from Military Surplus. If you'd like to be the first to review this particular 5.56x45mm ammo from Military Surplus, fill out the form below. Q: Is this light armor penentrating like M855? A: Hello! This ammunition is loaded with the SS109 steel cored projectile. The SS109 projectile is the same projectile used to make the M855 round.